On Friday, July 13, I was thrilled to learn that not one, but two GURPS Fourth Edition supplements were nominated for the 2012 ENnie Awards. 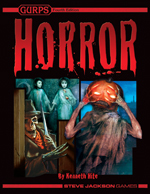 GURPS Horror was selected for three categories and GURPS Social Engineering was chosen for one. When I found out that both of our submissions made the final cut, I was so excited I immediately got in touch with Sean Punch, our GURPS line editor. "Obviously, I'm thrilled to see GURPS put in such a strong showing, but the specific products nominated make the news extra-gratifying. GURPS Horror is the latest edition of a beloved classic, with roots reaching back 25 years to the dawn of GURPS, and it's wonderful to see recognition for what I believe is the best version yet. As for GURPS Social Engineering, its nomination validates my personal belief that RPGs have room for talk and finesse as well as action. Ken Hite and Bill Stoddard aced these projects, and I feel honored to have been involved! Congratulations to all of this year's nominees and don't forget to vote for your favorite games and game companies. And a mighty shout-out to everyone who plays and works on GURPS!